“As a little boy, I had a dream that my father had taken me to the woods where there was a dead body. He buried it and told me I must never tell. It was the only thing we’d ever done together as father and son, and I promised not to tell. But unlike most dreams, the memory of this one never left me. And sometimes…I wasn’t altogether sure about one thing: was it just a dream?”When Augusten Burroughs was small, his father was a shadowy presence in his life: a form on the stairs, a cough from the basement, a silent figure smoking a cigarette in the dark. As Augusten grew older, something sinister within his father began to unfurl. Something dark and secretive that could not be named. Betrayal after shocking betrayal ensued, and Augusten’s childhood was over. The kind of father he wanted didn’t exist for him. This father was distant, aloof, uninterested…And then the “games” began. With A Wolf at the Table, Augusten Burroughs makes a quantum leap into untapped emotional terrain: the radical pendulum swing between love and hate, the unspeakably terrifying relationship between father and son. Told with scorching honesty and penetrating insight, it is a story for anyone who has ever longed for unconditional love from a parent. 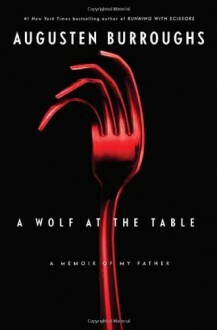 Though harrowing and brutal, A Wolf at the Table will ultimately leave you buoyed with the profound joy of simply being alive. It’s a memoir of stunning psychological cruelty and the redemptive power of hope.